7-year-old Innosanto spends an exciting night with his mom sleeping under the stars in the Jakarta Planetarium. Innosanto's father is a playwright and the boy memorizes lines during the actors' rehearsals, so they invite him to join the performance, which tours the country. The play is about a General, who doesn't treat people very well, "so they decided to do a play about how that was wrong." Fact: Indonesia aka The Spice Islands is the place Christopher Columbus was looking for when he crashed in the New World. Fact: Indonesia is made up of 17000 islands where people speak over 750 different languages. Fact: when Inno was a child, speaking out against the government could land you in jail. On the last night of the performace Inno packs a toothbrush ("they figured if you're going to go to jail for a long time, you may as well have your toothbrush with you so you can keep your teeth clean. (true story). "), the curtains go down, and with soldiers on the way, the actors scatter into hiding. 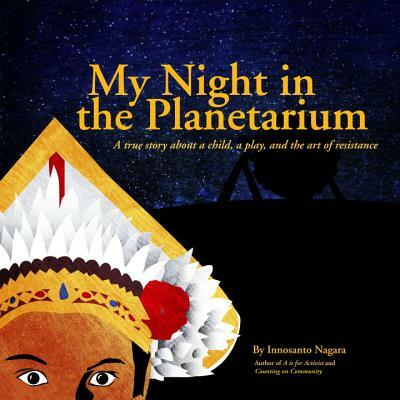 On its surface, My Night in the Planetarium is a modern Indonesian children's story about one night in the late '70s that the author got to spend in the Jakarta planetarium. But it's actually much more than that. It's an introduction to the history and culture of Indonesia. It's about colonialism, revolution, how power corrupts, and how through art and solidarity liberation can be won. "In difficult times, stories are vital. They are tools we can use to fight against systemic oppression. Now, more than ever, we need to hear and tell empowering stories of resistance. We must share these stories with children, especially in classrooms, where group discussion can be encouraged and perspectives respectfully exchanged. "My Night in the Planetarium is a sweet, smart tribute to the author's father, to the radical power of art, and to the rich history of Indonesia. With gorgeous illustrations and an engaging narrative, this is art and resistance as seen through a child's eyes, and told by a fantastic storyteller."